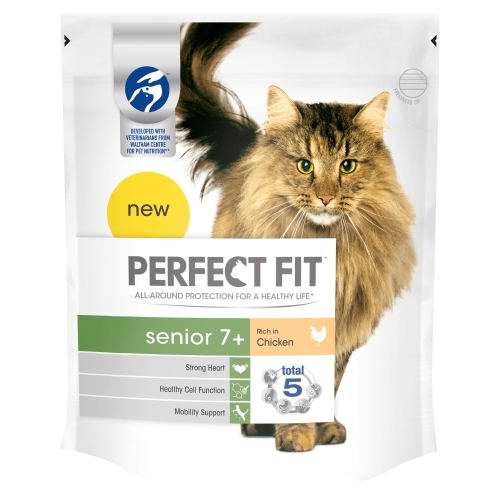 Perfect Fit Senior 7+ Dry Cat Food Rich in Chicken is deliciously unique. 100% complete, it offers balanced nutrition and all-round health protection. Containing a ‘Total 5’ formula, it provides 5 benefits addressing the most common health needs of all cats: digestion, urinary tract, natural defences, skin & coat, optimum weight management & body condition. Perfect Fit Senior will retain your cats' youthful spirit, day after day! •	Rich in high quality protein to support muscle strength. •	No added artificial colourants. Dried Poultry Protein1 (including 18% Chicken),Wheat, Maize Flour, Soya Protein, Greaves Protein, Poultry Fat, Maize Protein, Soya Meal, Rice (4%), Liver Digest, Yeast, Sodium Chloride, Potassium, Chloride, Sunflower Oil (0.4%), Fish Oil2 (0.25%),1Natural source of Glucosamine, 2Natural source of Omega 3 Fatty Acids. Protein 38%, Fat content: 13%, Inorganic matter 8.5%, Crude fibres 1.9%, Calcium 0.89%, Phosphorus 0.94%.